He is adamant about not wanting to have any buns, the first time we try them. Oh well, he can be weird sometimes, our D.
We sit at the table, bound by brunch. Feasting. ‘Best brunch ever, best brunch ever’, the children chant without placards and my heart is aflame. With joy. 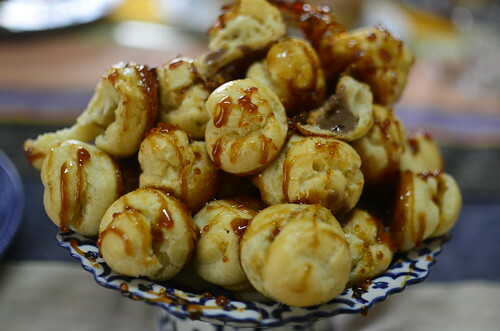 We’ve just had a buffet of Choux buns, Madeleines and ‘Chocolate Fondue’. We’ve chatted as we’ve dipped long-stemmed forks holding pieces of fruit, cake and toast into one pot of warm, melted chocolate. Chins are dripping, white t-shirts splattered brown and there are happy faces all around. My long week at work and late arrivals home are distant memories. I believe that families are made of memories and traditions, bound together in love. I want my children to go through life’s journey armed with joyful recollections of their childhood, secure in the love that surrounds them. My mind goes back to my own childhood with fondness and warmth. Though both my parents worked full-time – my Dad as a marine engineer with Shell, and my Mum as the owner/proprietor of a nursery and primary school, I remember them as being ‘present’, as being there. I remember Sundays, when we would get special treats of ‘Tree Top powder’. My dad would open up the sideboard, and out would come little white sachets, with orange pineapples drawn on. I loved licking the powder off my palms like a lollipop, instead of making a drink by adding water. I remember travelling with my Mum to teaching centres when she had to mark examination scripts. We looked forward to the journey mostly because we knew she would cook her specialties: Jollof rice – smoky and spicy with tomatoes and delicious fried chicken. We would eat in the car on white paper plates, with plastic spoons and forks and I tell you, no Jollof rice has ever tasted so good. At the centres, we would sit at her feet, reading books and munching on chinchin (fried pastry bits) and coconut jam cookies as she worked. This is what I want for my children – the memories and the knowledge that though I work, I am ‘there’. I want them to understand that work makes a lot of things we enjoy as a family possible. And so I strive to bring the best of my work ‘home’ and vice-versa; because I have to make work, ‘work’ for me. Occasionally, I’ll take time off work to volunteer at the kids’ school, to talk about being a geologist and perform science experiments. At home, the kids and I often build volcanoes out of aluminum foil, mud or play dough. We create eruptions, combining vinegar, baking soda and food colouring. So when my eldest daughter J, is studying volcanoes at school, I confidently approach her teacher with an offer of help. She agrees to a session where the pupils ‘erupt’ their own volcanoes. The session is so rewarding – the pupils are excited, my daughter is proud (of her geologist mum) and I learn as much from them as they do from me. I’m even able to answer ‘tricky’ questions like ‘How do volcanoes grow?’ My on-the-spot response of ‘They build themselves from the cooled lava that flows out of the crater’ meets with heads nodding in agreement. Phew! I am thankful I can share my knowledge of geology while spending time with my children. It creates those memories I desire for them, memories of ‘Mama being there’. 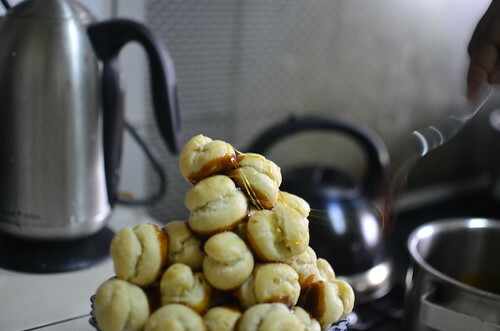 In the past, I’ve baked cupcakes, and made vanilla ice-cream at school, for I love food. These are the things I love….and do well. ‘You’ve got to find what you love…. …. So keep looking until you find it. I love most the fact that we currently live in Port Harcourt, where I spent a part of my childhood. It means I can show the children the verandah I sat under in the house I lived in; that we can ‘pluck’ pitanga cherries off the trees that I climbed as a child, that we can play with the ‘touch-me-nots’ I loved when I was ten years old. It means too that we can discover new things together like tree squirrels dancing on tree branches, things that make it not only my place, but our place. In spite of my best intentions, things do go awry. I can’t attend my youngest daughter’s music recital and she’s in tears. ‘You promised’. ‘I know but I have to attend a meeting at work’. I’m mad at myself. She’s upset and I desperately want to make it right. The only thing that will placate her is if ‘I promise to watch the video recording’. Even though I’ve cautioned myself about ‘making promises I’m not sure I can keep’, I promise her for I know it is possible. I want to be the mother whose children believe her, believe in her, and trust that she is the mother for whom work is not the sole focus. There are two things I do when I’m home: I kiss them (awake, goodbye, good night) and I make their lunch boxes, no matter how early I leave for work, or how late I return. These are the things we want – for me to show my love in a language they understand. In it all, I know for certain that while they’re at school, and I am at work, they have a piece of me, and my love. 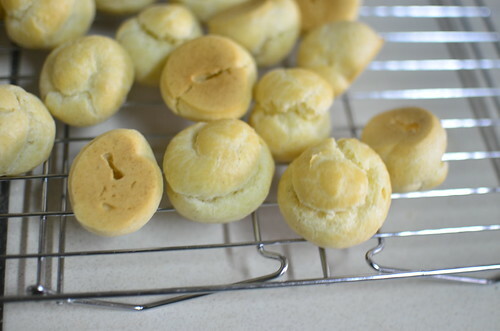 And so when we sit to feast on Choux buns that Sunday, to delight in cream-stuffed baked dough, there is lots of love and laughter because D’s refusal to eat Choux buns actually stems from the fact that he isn’t yet privy to French sophistication spellings…and therefore thinks Choux refers to ‘Shoe‘. It is only when he asks, ‘How can I eat buns made of shoes?’ that we get it! I explain to him, rather carefully and we eat away. In happiness. Contentment. Joy. I’ve learnt in the last few years that brunch works well for me. For us. 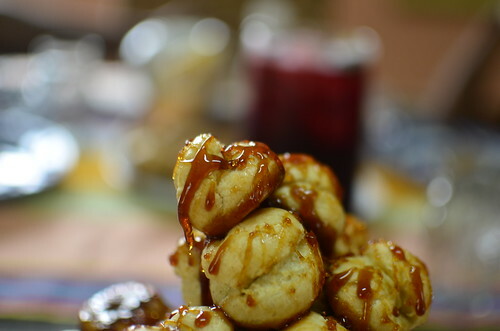 Gives the kids time enough to sleep, and me time to bake and photograph :). 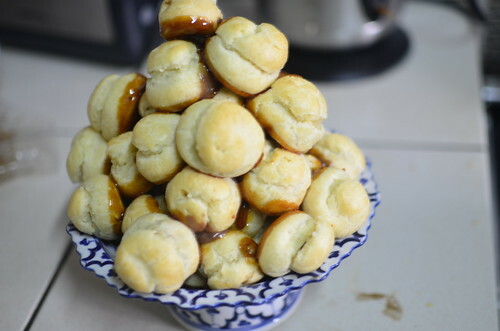 I’d already decided to attempt a Croquembouche. 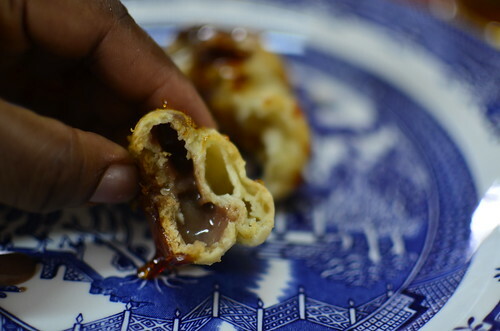 The thing I was most worried about was how to tackle the caramel………I mean burnt sugar is nothing to joke with. Especially on Christmas morning! “And here is the site for that awesome and fearsome pastry chef, Adriano Zumbo. 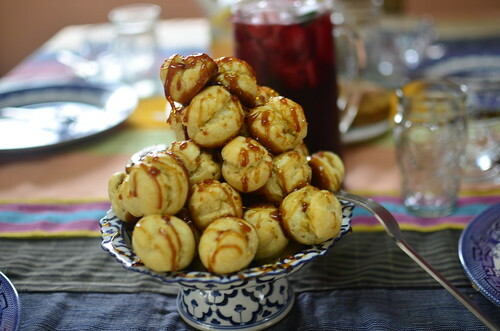 A funny thing about the Croquembouche challenge (on Masterchef Australia), it was gruelling, I found myself holding my breath at one point, but afterwards sales of Croquembouche cones skyrocketed. I wanted one myself”; email my friend L sent to me in 2010. 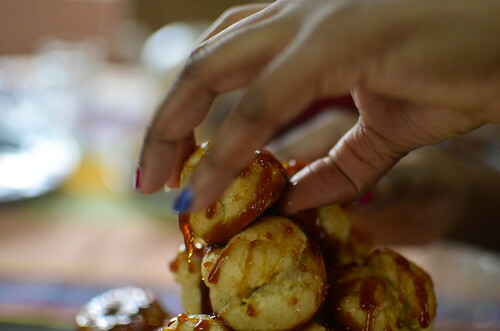 I turned to Master French Pâtissier, Eric Lanlard for this recipe. The recipe below makes 25. I doubled it! Preheat the oven to 180°C/ fan160°C/gas 4. 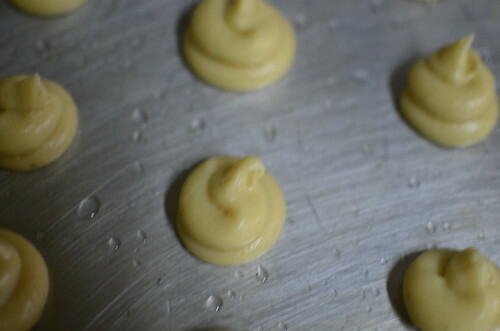 For the Choux pastry, put the butter and 150ml water in a large pan over a medium heat. 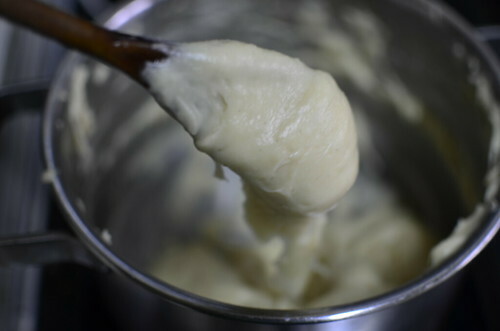 When the butter has melted and the water is simmering, quickly add the flour and mix to a thick paste. Mix over the heat for 1 minute, then set aside to cool to room temperature. Add the eggs, 1 at a time, beating well before adding the second egg. 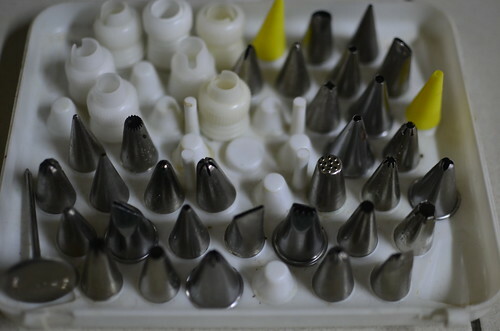 You should get a thick, glossy, dropping-consistency mixture. 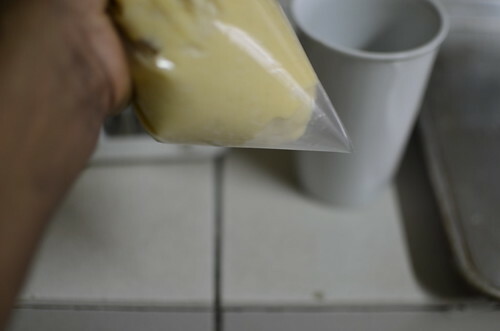 Transfer to a piping bag fitted with a plain 1.5cm nozzle. Which I didn’t have…………so a ziploc had to do! Bake for 15 minutes or until well risen and golden. Mine took longer to brown, about 30 minutes altogether. 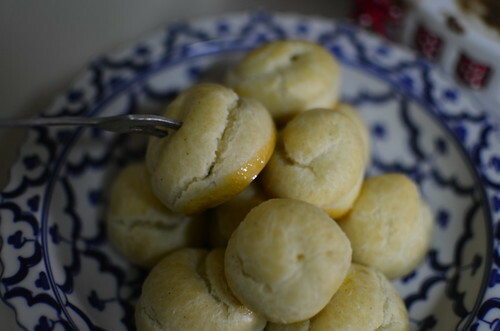 Carefully make a hole in the base of each bun with a sharp knife. Pop back in the turned off oven for 5 minutes to crisp up the centres. Transfer to a wire rack to cool. Meanwhile, make the filling. Put the milk and chocolate in a pan over a medium heat, stirring to melt. When just simmering, remove from the heat. 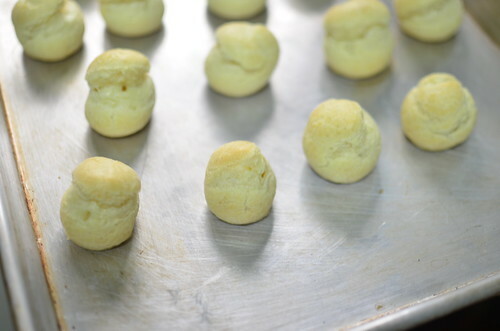 In a heatproof bowl, whisk the egg yolks and sugar together, until pale and creamy, then mix in the flour. Slowly mix in the chocolate mixture, then pour it all back into the pan. Return to a medium-low heat and cook, stirring continuously, for 5 minutes, until thick and glossy. Cool, dust the surface with a little icing sugar to prevent a skin forming. 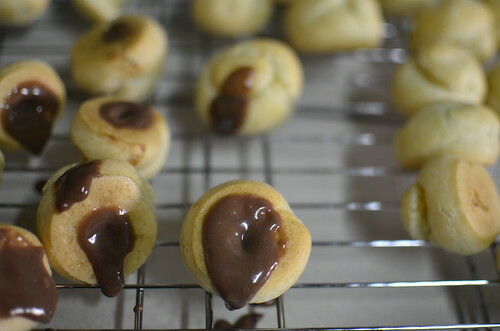 Spoon the pastry cream into a piping bag fitted with a plain 5mm nozzle. 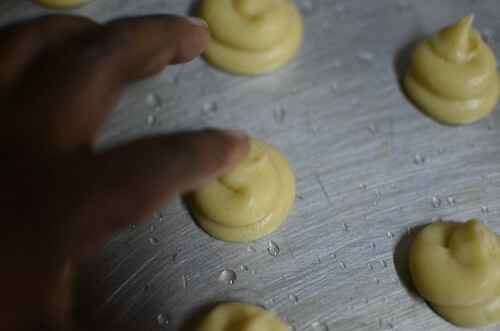 Fill each bun, pushing the nozzle through the base-hole. For the caramel, set a large bowl of cold water to one side – for when you take the caramel pan off the heat – to stop it cooking. 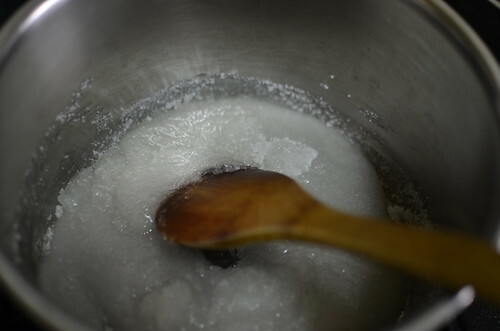 Then put the sugar and 2 tablespoons cold water in a wide, stainless-steel pan over a low heat. Melt gently, stirring, to dissolve the sugar. 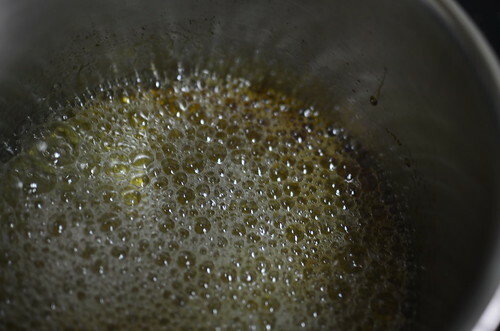 Increase the temperature and simmer, without stirring, until a golden amber colour – be careful as it will easily burn. Cool slightly. Mine crystallised….and I was distraught. Till Daughter #1, J, came in and said ‘Mama, why don’t you add a little bit more water’. 4 tablespoons of water and mere seconds later, the caramel began to form! I was amazed. And thankful for her presence! Once the caramel turns golden, take it off the heat and immerse in water – it will continue to cook, and darken….burnt is seconds away so please be careful! Sugar work requires presence of mind….. 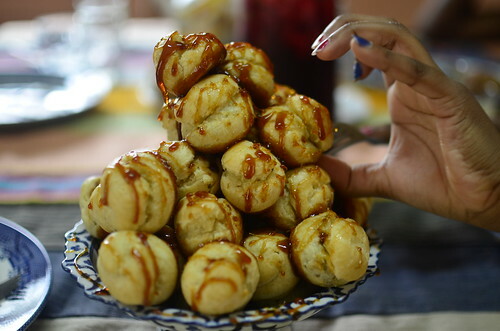 Carefully dip a little of each bun into the caramel, allow the excess to drip off and stack the buns up into a pyramid shape. 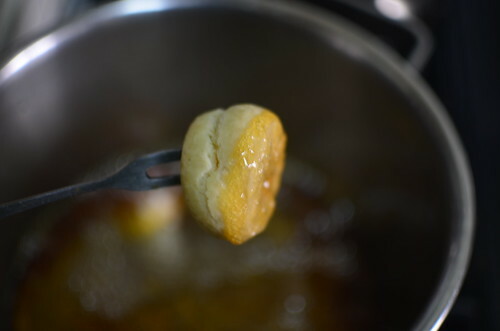 To make the spun sugar, return the caramel to the heat to melt again. 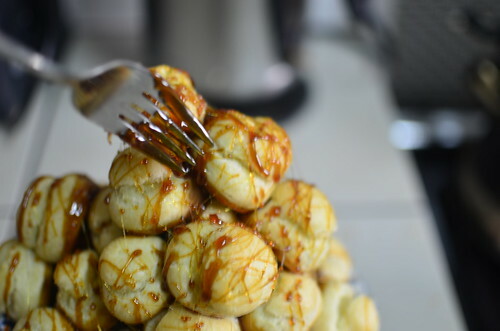 Dip in a fork and flick back-and-forth over the croquembouche, repeating until you have lots of fine strands of hardened caramel all over the buns. Decorate with flecks of silver leaf, if you like, to serve. 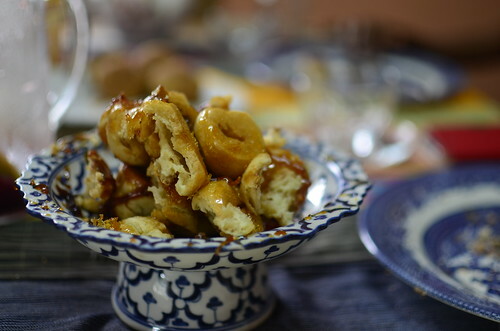 We loved it – the contrast in textures – crunchy, bittersweet caramel, with soft, chewy bun and almost liquid centre. Perfect for Brunch.